Bocadillo (guava) roscón or arequipe (dulce de leche) roscón? Each has its own fanbase and from what I’ve seen, I think the arequipe roscón wins but by a very small margin. 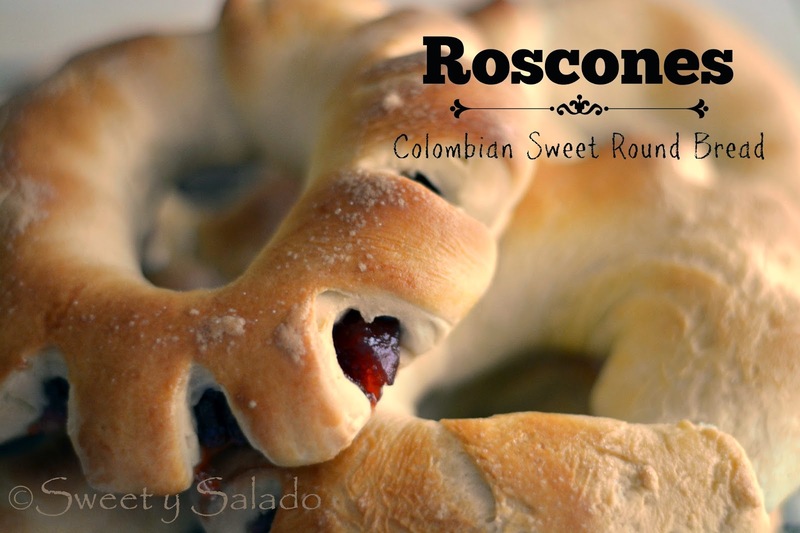 The point is, roscones of any flavor are very popular all over Colombia and they are sold at almost every bakery. I don’t remember eating them in Colombia for some reason but I do remember their smell, especially the guava ones since back then arequipe was not used that much in baking the way they use it nowadays. The recipe is very simple and I always use the same dough I use to make my cinnamon rolls because it’s sweet and fluffy, perfect for making these roscones. As for the filling, I always use bocadillo because it’s solid which is key so it doesn’t ooze out of the dough when baking. I used to make the arequipe roscones with homemade arequipe or with the regular kind you buy at the stores because I can’t find baking arequipe anywhere and as a result, it would always, always, always, ooze out of the dough. The solution was using an arequipe fudge I found at the Latin store I always go to to get my Colombian products. The first time I used it I wasn’t sure if it was going to work because it’s not as solid as I had thought and it kind of crumbles when you touch it but it worked like a charm. When I took the roscones out of the oven the arequipe stayed intact inside each roscón and I didn’t have any issues. So there’s the secret, only use solid arequipe and also, don’t make any cuts to the dough the way you make them for the ones filled with guava. 2. Add the egg and melted butter to the yeast mixture and stir well. 3. Add flour, white sugar and salt to the bowl of a standing mixer and whisk well. Process continues in step 5 below. Follow steps 1 & 2 above. 3. Add flour, white sugar and salt to a large bowl and whisk well. knead the dough, fold it over and push down with the heel of your hand. when it is smooth and elastic. 5. Grease a large bowl with the oil. inside. This will help it rise better. 7. Slice the bocadillo and/or arequipe into 8 long strips measuring about 8 inches (20.5 cm) long and ½ inch (1.25 cm) wide. 8. Once the dough has doubled in size, gently punch it with your hand and roll it into a log that measures about 16 inches (40.5 cm) long. Cut the log into 8 equal pieces. 9. Flour a flat surface and with a rolling pin flatten each piece into rectangles that measure about 10 x 4 inches (20.5 x 10 cm). 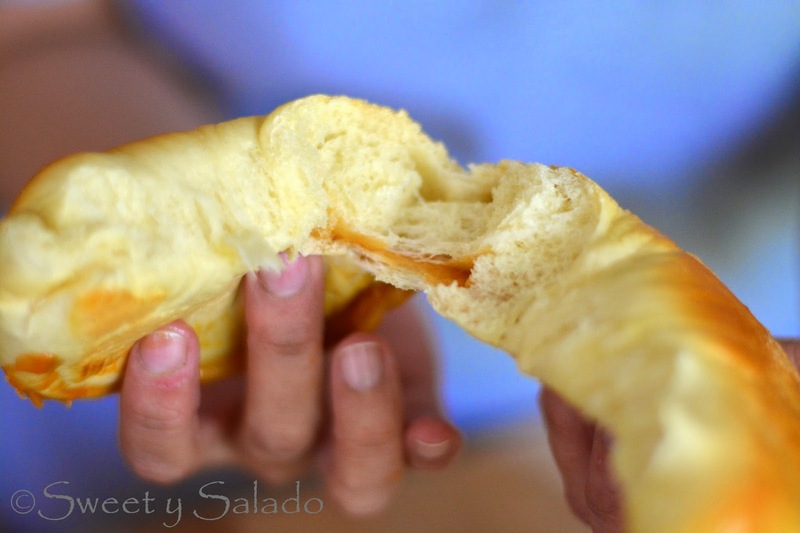 To make the bocadillo roscones, place a bocadillo strip a little above the center of the dough. Fold the top part of the dough over the bocadillo and roll it in. Make a few cuts along one of the edges of the dough and then connect both ends to shape the roscón. To make the arequipe roscones, place an arequipe strip a little above the center of the dough. Fold the top part of the dough over the arequipe, press it with your fingers and roll it in. Then connect both ends to shape the roscón. 10. Place all roscones on a cookie sheet lined with parchment paper. Brush the roscones with the egg wash and sprinkle white sugar on top. Let them rise for about 20 minutes. 11. Bake at 350ºF (180ºC) for about 20-25 minutes or until golden brown. Let them cool for a few minutes on a cooling rack and serve. for a few seconds until warm. Where can you find Arequipe fudge? Any recommendation? You know, I find it at one of my local Latin stores and online. I'm trying to find a good recipe to make and if I get good results, I'll share it on the blog. that was great became like back at home..!! Do you have a recipe for mojicones? Not yet, but funny you should ask because my plan is to film it this weekend! Can you refrigerate the dough after it's risen in the microwave for an hour and a half? We realized how exhausted we we're and want to finish tomorrow if possible. Yes, you can. I have shaped bread rolls and cinnamon rolls after the first rise and put them in the fridge where they will sort of rise the second time. The next day you can take them out of the fridge and let them finish rising on the counter before baking.